At the moment it appears to be announced for only Japan, but I can't imagine that it wouldn't appear elsewhere. I'm also not entirely clear on whether it is a completely new game or an expanded port of the 3DS game, but it appears to at least have some new content. For those who have not played the 3DS game, Pushmo is an Intelligent Systems developed puzzle game where to push and pull blocks to make your way to a goal. And it is awesome. Pushmo World will be hitting Japan June 19th, will cost 1,000 Yen, and will be 1GB in size. This is awesome news! I love Intelligent Systems and I love Pushmo. Papa Blox for Smash! Ever since getting into FE and AW over the past year, Intelligent Systems has only gotten better in my eyes. Pushmo was great, so I'll keep my eye on this one! Sweet. This must be that unannounced Intelligent Systems game for Wii U.
I am SO in. Great news. 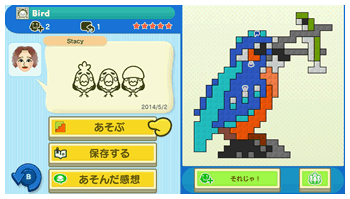 Not sure why it needed to be Wii U, but it looks good and I am quite excited for Pushmo with Miiverse. Weird...did they orchestrate the soundtrack? Or is that just really good synth? This game always looked cool to me but way too hard, so I never took the plunge. At 1:17, I think those blocks that flash a few times and then snap back into the background are new. Looks like they reset after a few seconds. And at 1:55, I think there are sets of blocks that are linked, as in when you pull one color, the other color gets pushed in, and vice versa. Plus, Miiverse integration! So I'm guessing there will be no shortage of new stuff. But I think I've had my fill of Pushmo after 20 hours on the 3DS version. It's a little hard to tell in the trailer, but I don't think it's orchestrated. The flute sample is pretty good though. @-JKR- Well... some of the end puzzles are super hard, but I'd say like 90% of the puzzles are easy to medium difficulty. And there are a TON of puzzles, so you can get pretty darn far before getting "stuck". And you can skip the ones you get stuck on anyway. Heck, I never completed the original Pushmo and never played the sequel. I watched the video, looks like the game should be easy to play, even without the stereoscopic 3D. The graphical fidelity is really nice. Should be easy enough to see what's going on, even without stereoscopic 3D. I would bet improved camera control too just to give you that edge when needed. The music does sound great too. Higher fidelity as well. Definitely one of my all-time favorite games and a Wii U sequel is an insta-buy. With the new feature(s) in the game and the beautiful graphics, it's guaranteed. Those timed blocks are surely not all that's new and I can't wait for this to drop. I would hope it'd be a simultaneous release with Japan but I would hope it's no later than Aug/Sept in english-speaking territories. There's text to translate, but how much really? Puzzle names and menus? Slight character dialogue? This is not Harvest Moon. Coming to Europe on June 19th too, so I'm optimistic for a simultaneous US release. Europe is getting sales on Pushmo and Crashmo leading to the release and then you get a discount on the Wii U game if you own the 3DS games. Sounds like too good an idea for NoA to do, but it would be a perfect chance for me to finally get Crashmo. So this is what Intelligent Systems has been working on...hm. This is good news and bad news. It's good, because hey. More Pushmo. It's bad too though, because this means there is probably not going to be an Advance Wars game for a while. So, more Pushmo? No complaints from me! Looks cool, does it support 3-D for those with 3-D TVs? This is one of those 3DS games tha was smartly designed around the use of 3-D and it would be a shame to lose that aspect of it. Hopefully not, but who knows. I'm not sure how big the team is at Intelligent Systems - could they really split their work force and focus on more than one project at a time? It seems we only get one game from them at a time, and very rarely do we see releases in close proximity to each other. Does seem like a small team would have been behind this. I mean the 3DS Pushmo games were made concurrently with Fire Emblem: Awakening, right? The only other thing we know they've been developing lately was Daigasso Band Brothers P, which released in Japan in November. Seems like a large team is unaccounted for.